We can't recommend enough that you arrive early before our actual trip begins. 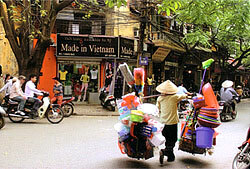 Hanoi is one of Asia's most fascinating cities and certainly it's most walk able. Like Paris, every street presents new activity, interesting shops and sights. If you arrive a with a couple of days to spare, kayaking on Halong Bay, a UNESCO World Heritage Site, is an unforgettable experience. Arrive Lao Cai 6:00 AM. Group photo at on the forbidding Chinese border crossing 4 km north of the train station (one has never seen so much barbed wire). Saddle up for Lao Cai to Sapa grueling ride 22 miles straight uphill from the train station, gaining over 4,000 feet to Sapa town on a winding road past terraced rice fields. We'll suffer on this our first day, but the abrupt elevation gain will provide some nice down hills on subsequent days. Let's hope for sunshine otherwise Sapa will be chilly, perhaps wet. 41 miles today (73 kilometers), starting with a group photo in front of the Victoria before leaving the other tourists behind. We begin with moderate six-mile climb out of town over the highest paved pass in Vietnam (below Fansipan), passing small villages, waterfalls and cliffs before enjoying a splendid 15-mile descent. 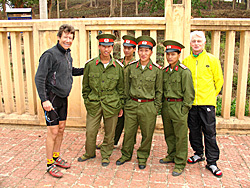 After rollers and another six mile climb into Tam Duong. This section of road is one of Vietnam's most beautiful, with lush scenery and the added mix of colorful hilltribes who we'll frequently stop to visit. Dinner in town. Accommodation at the basic Phuong Thanh hotel. 62 miles, with a wonderful 10-mile descent. Rolling hills and dirt road. The route to Lai Chau is spectacular mountain and river valley scenery. 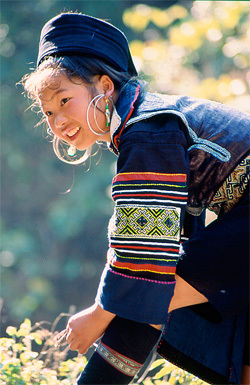 Black Thai villages are numerous in this area and we may see Black Dao and H'mong, especially nearing the Tam Duong market. Overnight at Lan Anh hotel. 60 miles, about 10 miles in climbs, flat to rolling over "highway" 12. Long dirt sections, lush scenery of ferns, banana trees, and jungle foliage. 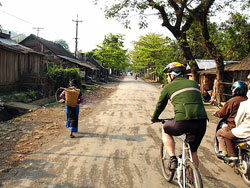 White Thai, Red and White Hmong villages dot the lush landscape. Arrive in famous Dien Bien Phu where the French faced their final defeat. Overnight Muong Thanh hotel. 54 miles and Pha Din Pass legs permitting. After breaking in Tuan Giao, we'll conquer the 16-odd miles of Pha Din Pass over highways 279 and national route 6 to Tuan Giao, bicycling up the switchbacks on this long Alpine-style climb. A beautiful ride with little traffic, through gorges lined with steep cliffs part of the way. Showers and food in Son La. Late afternoon bus transfer to Son La (2 hours). 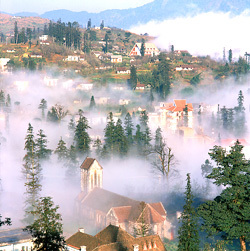 Son La is a remote post and administrative center. Few if any tourists here but loads of bureaucrats eager to meet and take photos with us. A fast, mostly downhill ride down a newly improved 4-lane road. Passing along the Ma River, karst scenery passing by as we ride through the countryside, small farms and villages en route to Mai Chau, a fertile river valley, the most beautiful one we've seen the entire trip. 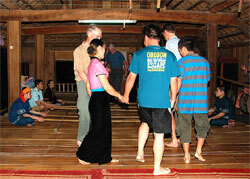 After a refreshing dip in the hotel pool, we'll stroll to a nearby hilltribe village for a traditional dance show and dinner. 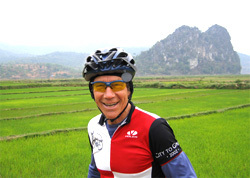 Today, a leisurely morning followed by our last ride out of Mai Chau (a steep but short climb), then rolling countryside and towns. 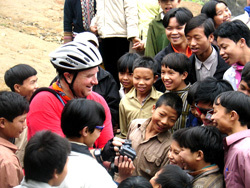 We'll pause to visit a local school, meeting with the children who will be eager to test out our bicycles. Reaching Lam Song, we'll pack up our bikes for the two hour drive back to Hanoi, arriving in time to freshen up before venturing into the Old Quarter for a delicious farewell dinner.